Gulf Craft, the largest manufacturer of luxury yachts and fibreglass boats in the Middle East and Asia, premièred a brand new superyacht concept from its Majesty Yachts range – the Majesty 105 – on the opening day of the Dubai International Boat Show 2012. The première follows this yard’s recent launch of its largest ever hull construction – the Majesty 135. 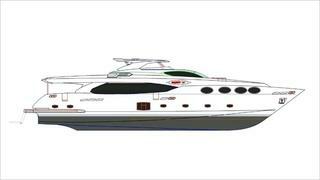 The Majesty 105 will run on twin Caterpillar C32 rated engines and is expected to reach top speeds of 27 knots. The interiors will be furnished in gold teak veneer with soft, light carpeting and furnishings in a sea-inspired colour scheme that gives a nod to Mediterranean elegance. Extensive exterior space – including an outdoor steering helm and a hard-topped sundeck fitted with comfortable sofa seating, a wet bar, refrigerator, icemaker and barbecue – will make this the perfect yacht for outdoor entertaining.